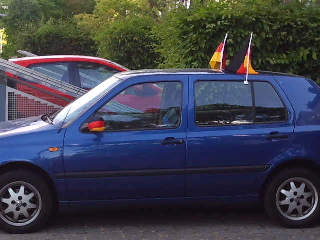 World Cup fever is in full swing here in Germany at the moment. It's fun living in a country while they are competing- there's a great atmosphere! 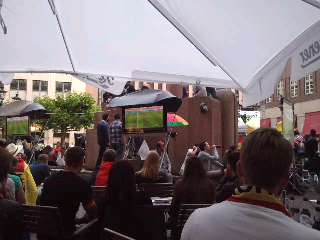 Lots of places offer "public viewings" as they call it where you can watch the games outside on a big screen. This is my second World Cup since I've moved here, and I was also around for the European Championship two years ago when Germany made it to the semi-final. Germany tend to do well and get far in the World Cup. Unlike Ireland unfortunately who didn't even qualify this year! Last time around we nearly got in if it weren't for Thierry Henry's hand, which Irish people have a hard time forgetting! I enjoyed reading this: Never forget the hand of the frog written by a French woman living in Ireland. I remember the Summer of 1990 really well when Ireland made it to the quarter-finals in the World cup. It was such a great atmosphere! And the song: "We're all part of Jackie's Army, We're all off to Italy, And we'll really shake them up, When we win The World Cup, 'Cos Ireland are the greatest football team!" which everyone was singing at the time! Germany's next game is tomorrow evening against Algeria. 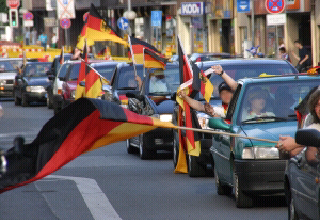 So if they win everyone will be doing the "autokorso" thing where they drive around in their cars beeping the horn and waving the German flag. Are you following the World Cup this year?